Juwai.com, the most influential international property site in China. • his extensive experience in establishing and doing business in China. 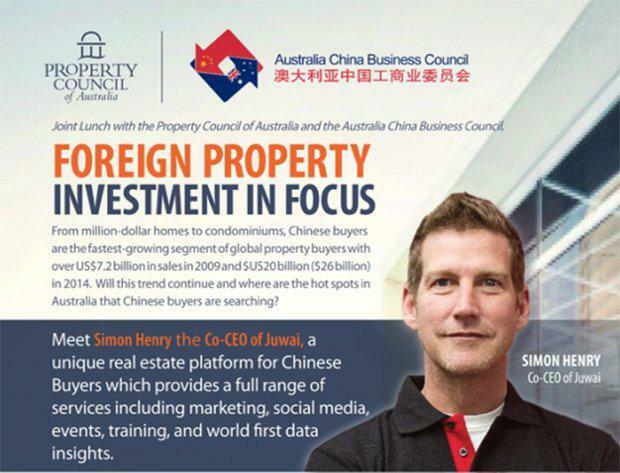 Juwai.com, China's largest international property website for Chinese buyers, was founded by Queenslanders Simon Henry and Andrew Taylor in 2011. The company has partnerships with listings services, real estate agent networks and property portals around the world. The company also assists Chinese international property buyers and high net worth property investors around the world to connect them with real estate agents and developers. The site is visited by thousands of Chinese buyers each day from over 315 cities throughout China, as well as from buyers from Taiwan, Hong Kong, Malaysia and Singapore. Simon has over 20 years experience working in the real estate sector internationally.